For just over four months the eyes of the world have been turned to Livorno, where Benetti has surpassed itself with the launch of three epic yachts. Last December, 107-meter FB277 was launched, followed in February by FB272, another over 100m yacht, and now, completing this trilogy of staggering yachts, 108-meter FB275 has been launched. Italian yacht building has never before seen the likes of such a period of immense productivity and the accomplishments of Benetti mark a new era for the shipyard in which it will compete with the builders of the very largest private yachts in the world. 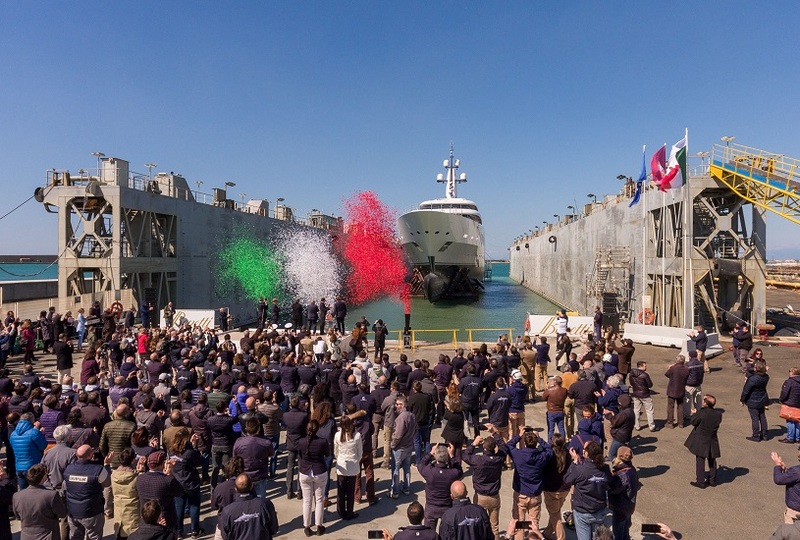 Marking the end of the first part of the ‘Giga Season’, but also a longer-term plan to build larger yachts, Benetti’s Giga yacht construction programme has been the subject of major investment at the shipyard. An ambitious business plan has prompted financial input in infrastructure, organisation, safety and security, to overcome the challenges presented by building such gargantuan yachts. Expansion at the Livorno shipyard, in the form of two new generation steel structure sheds, have enabled Benetti to massively increase its productivity. The sheds are each of 58.5 x 137 meters and a height of 30.4 meters, and both are equipped with two gantry cranes with a maximum capacity of 40 tonnes. The programme enabled Benetti to build three Giga yachts in parallel. The development by Benetti of the Giga yacht construction programme has also required the creation of a special team of experts in this specific type of project. Today, Benetti is one of very few shipyard in the world with the capacity and capabilities to build yachts over 100 meters long.